CBC’s The Exchange recently sought out driving instructor Ian Law for his best tips on how to keep in control when things get chilly. In this video item, host Bruce Sellery takes the wheel while Law offers his top seven tips for staying safe on icy roads. Unlike all-season radials that come installed on most new cars, winter tires are designed to handle cold, slippery conditions and offer far greater control on icy roads than cynics, who think they’re not worth the expense, believe. Many insurance plans now offer discounts of up to 10 per cent if you use winter tires. A car that’s in good working order will be safer in a crisis, since all systems will be working the way they were designed to. Something as simple as making sure your fluids are topped up and fresh can be vital, Law says. That’s especially true of when it comes to a driver’s ability to see the road: Installing fresh windshield wiper blades and ensuring the wiper fluid reservoir is full can save your life. 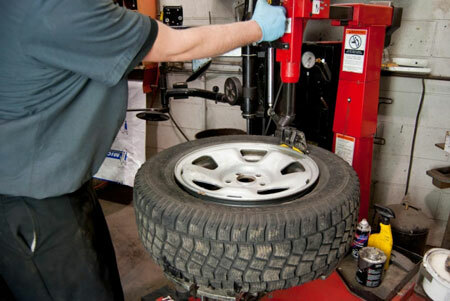 Our skilled technicians can mount run-flat & low-profile tires, service vehicles with TPMS systems, and much more! Copyright © 2019 The Tire Store Ltd.